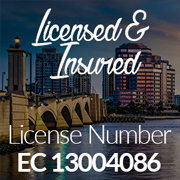 Established more than 40 years ago near Palm Beach, Florida it’s still Van’s Electric Services that provides only the best 24hr electricians, 24hr emergency electrical service, 24hr emergency service and electrical repairs throughout Palm Beach County, Broward County and Miami-Dade County. With the very best professional Palm Beach 24hr electricians around for all sizes and types of commercial, industrial or residential 24hr emergency electrical service and commercial, industrial or residential electrical repairs or electrical equipment installations for more than 40 years. Contact Bruce at Van-Electric by filling out the form on this page or giving him a call. If you are looking for the very best Palm Beach County, Broward County or Miami-Dade County 24hr emergency electrical service or 24hr electricians, just pick up the phone and call Van’s Electric Services. Your call is ALWAYS answered by one of our qualified 24hr electricians or a 24hr emergency electrical service professional 24hrs a day, 365 days a year with NEVER an extra charge to our valued 24hr emergency electrical services customer!